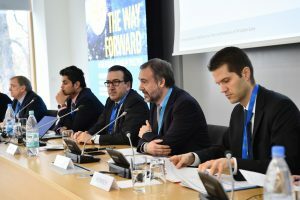 From 13 to 16 November 2018 the United Nations/Germany High Level Forum took place at the UN Campus in Bonn with over 300 high ranking participants from all over the world, discussing about the way forward after UNISPACE+50 and on Space2030. BHO Legal partner, Oliver Heinrich had the pleasure to participate in Session 3 – Legal Regime of Outer Space And Global Space Governance together with Ms S. Al Hajeri (UAE Space Agency, Head of Space Legislation and Policy), Mr B. Schmidt Tedd (DLR, Head of Division UN-Affairs Space Administration), Mr B Goswami (McGill University, MILAMOS Research Coordinator), Mr M. Ferrazani (ESA, Head of Legal Department Services), Mr I. Tirado (UNIDROIT, Secretary General), and Mr A. Misztal (Ambassador at Large for Multilateral Cooperation in Public International Law, Minstry of Foreign Affairs of Poland). Please feel free to download his presentation on NewSpace – Legal Issues and visit the the UN Website for more information. Thanks to all the participants for making the HLF a success.